At the start of 2018 we had a competition to design your own Papergang box. With well over 2000 entries, you guys did just that! It was so hard to narrow them down to just 1 lucky winner, so our design team hand picked 4 entries that tickled their fancy. As it was just too hard to decide, they left it up to you, our wonderful Papergang followers! You voted for your favourite design via Instagram and Beth Tibbles’ abstract dinosaur pattern reigned supreme! 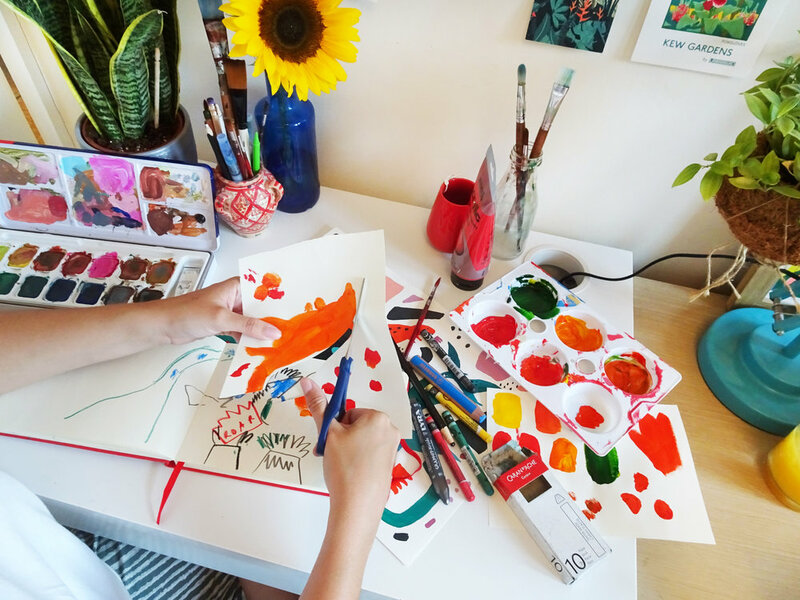 We talk to Beth about her competition win below and she shares her advice to those who are apprehensive when it comes to posting work! Thanks for speaking with us! Tell us a little bit about yourself – where are you from and what got you into illustration? I am an illustrator living and working in Eastbourne, I have lived here most of my life, apart from a few years away at uni. I love being so close to the sea and the country side, it’s a great place where I get lots of inspiration from. I have a full time job but constantly draw in my spare time, as well as my love for art I am a keen yogi and a massive foodie. I have always been a creative person, I studied illustration at college and then went onto the University of Westminster to do an illustration and visual communications course. After leaving uni I had a bit of a love hate relationship with illustration, I couldn’t find a style or a way of working that suited me, so I really didn’t do any for quite a long time. I did the odd job here and there, but that was about it. Only recently since coming home from a rather prolonged holiday, have I found my love for it again. I spent my free time just drawing, painting and collaging, it was really enjoyable. I’m still developing my style and I’m sure it will continue to evolve as I try new things. It’s exciting to see your style grow Beth! Your imagery is so bright and colourful. Where do you get your love of colour from, and have you always worked with such vibrant tones? Thank you :) I really do just love colour, I think I’m just naturally drawn to it, so to me it’s obvious that it would creep into my work. I like to think I’m a fun and lively person so therefore I like to express that by using bright and loud colours. It’s not a colour palette I have always used in my work, but it’s what I’m enjoying right now and I feel it suits the type of art that I want to make. Along with your abstract patterns, you often post exciting illustrations of travel destinations and plants. Do you find travel to be a main influence in your work and what is your approach to creating an abstract piece? Yes!! I love to travel! I recently took 7 months out to hop around South East Asia (if only I could have stayed longer!) It was one of the best things I have ever done, I saw so many amazing places and it gave me so much inspiration. The colours, nature and the architecture were so bold and vibrant, I think this definitely translates in my work now. I think it’s really important to travel and see new places as often as you can. I don’t get much inspiration from just staring at the four walls of my bedroom, I like to explore and discover something new. 7 months travelling sounds incredible Beth! As you are the winner of our super-duper Pitch A Papergang competition, how did you feel knowing you had won?! And what promoted you to enter the competition? I have always been such a big fan of Ohh Deer that when I saw the competition on Instagram I felt inspired to give it a go. The idea of having my designs on a range of products was really exciting to me! It's something that I have always dreamt of doing. I love a challenge and this wasn’t something I had done before. I've never had to think about what my design might look like on a pin or as a notepad, so I felt this was a great opportunity to create something fun. Do you have any advice to those who are scared to take risks and enter competitions / showcase their work?! To anyone who is nervous or scared to enter competitions, or even post their work online, the best advice I could give would be to just give it a go! I was always so unsure about whether I was good enough; there are so many amazing talents out there and it’s hard when you constantly compare yourself to others. But you have to just go for it, even if you don’t win it’s still super fun to take part. Firstly you get to try and create something new, something you wouldn’t normally do, and secondly you’ll get lots of advice, compliments and words of encouragement from people you don’t even know. It really does push you to carry on trying and gives you the confidence you might have been lacking at first. I had never entered anything before this, I never thought my work would be good enough, but I guess I was wrong!! You’ll never know until you try, and I’m so glad that I did. Thanks so much Beth and congratulations again for being our Pitch A Papergang winner 2018! Want some stationery featuring artwork by our winner Beth Tibbles? Subscribe to Beth's Papergang Box! For £10.95 you will receive a box full of stationery goodness delivered straight to your door, (it's super groovy too!). Click here or the big button below to head over to papergang.com. PITCH A PAPERGANG - THE SHORTLIST!